British band The Hours have produced a music video for the version of the classic Slade track, Merry Xmas Everybody. 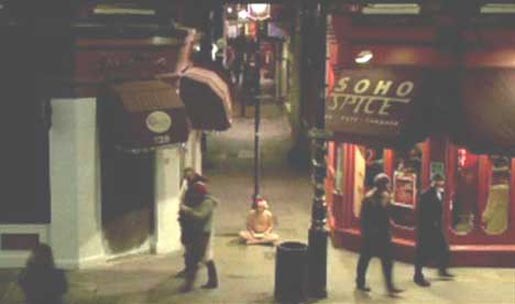 The video is simply a 4 minutes and 16 second shot of a naked man in a Santa hat (presumably homeless) placing himself on a corner of Wardour Street in Soho, London. Pedestrians pass him by, unaware of the film cameras on the first floor of the building across the road. Occasionally someone drops some money in his dish. The promo ends with the words, “Merry Christmas Everybody from The Hours”. Band members Antony Genn and Martin Slattery were inspired to make the video when they saw a TV advert for Slade’s Greatest Hits, featuring the 1973 song Merry Christmas Everybody. They recorded the song, put it on their MySpace site (December 10) and sought a film director. They approached Tom Carty, based in London, who on listening to the song believed it had something to say about humanity in 2007. Merry Xmas Everybody was shot in four takes on December 11 by director Tom Carty via Gorgeous Enterprises with director of photography George Steel and producer Helen Littlewood. Post production was done at Absolute Post and The Mill, London. Editor was Ted Guard at The Quarry. Are you hoping that the snow will to start to fall? In a bobby you have made? When you land upon your head then you’ve been Slade.